The next principle we’ll focus on within our series on email design is the principle of social proof. Social proof, a powerful social psychological tool, persuades users to act and comply to the actions of those around them. When applied to email marketing, ethis principle can help build the foundation of a successful and influential campaign. Taking a step back, the principle of social proof is just one of the many principles of persuasion developed by Dr. Robert Cialdini. For more context on the origin of these principles, we recommend beginning your reading at article one, if you haven’t done so already. When we’re unsure of something, we validate our decisions based on what other people think is correct. Follow along as we cover what social proof is, how the principle is supported, examples of social proof, and finally how you can apply this concept to your email designs. Think of a time when you had your first experience at a particular location or event. Maybe it was your first day of high school, your first experience at a concert, or your first time arriving at a new doctor’s office. Now, think of how you felt within those situations. Upon arriving to each location, you may have felt unsure of what to do, how to act, or even what to say. So most likely, to get your bearings, you observed how others were acting. For example, you’d note that the high school students ate outside for lunch, that the concert attendees all stood up rather than sitting in their seats, and that the patients at the doctor office grabbed a form to fill out from the counter upon arrival. Since you were uncertain of how to act on your own, you decided to act in the same way in order to blend in. This example embodies what social proof is. Social proof says that individuals will act in correspondence to those around them. When individuals are unsure of something, they validate their decisions based on what other people think is correct. This shows just how powerful the principle of social proof is, and why it’s important to implement into your email campaigns to persuade your users to purchase a product, register for an event, or inquire about a service. Now that you have some insight into what social proof is, we’ll move onto the proof of this principle. Throughout the years, dozens of studies have been conducted to support social proof. However, for the purpose of this article, we’ve chose to focus on one study that stuck out to us the most. This prominent study focused on canned laughter. One day, Dr. Robert Cialdini, founder of the six principles of persuasion, surveyed a group of individuals that came into his office. This group of individuals included a wide array of gender, age, and other various demographics. For example, some were students, others were professors, and some were janitors. Yet, when the individuals came into his office, Cialdini asked each individual one specific question—how do you feel about canned laughter? For those who don’t know, canned laughter is the laugh track that’s present within many television shows. Canned laughter is the laughter that goes off during the show after the main actor accidently slips, gets denied by the pretty girl, or tells a funny joke. The individuals’ responses to Cialdini’s question were very critical. Some called the canned laughter stupid and phony. Others called it extremely obvious and fake. With negative responses like these, Cialdini then questioned, if a wide majority of individuals viewed canned laughter as ludicrous, why then is it so popular with television executives? The answer is simple: Television executives know the research behind social proof. They know that the use of laugh tracks causes the audience to laugh longer and more often. They realize that, due to social proof, the audience views the fake laughter as the correct behavior. This is why, when the audience experiences the laugh track, even when they think it’s cheesy and know it’s fake, they feel obligated to laugh along. They hear peers laughing and think to themselves—everyone else is doing it, it must be the correct thing to do. Now that the proof of social proof has been explained, we’ll move onto the support. Here, we’ll provide three strong examples of social proof within emails. This phrasing is effective for several reasons. The first is the most obvious, in that it leverages social proof. When a user receives this email, they’ll see items that the staff hand selected and immediately feel influenced. They’ll be driven by the principle of social proof to engage with the same items themselves. We know this is successful because, based on the principle social proof, users are more likely to join in, purchase a product, or sign-up after they notice others doing so as well. Secondly, this email is effective not only because it uses social proof to influence the user, but also because it touches the fifth principle of persuasion, which is the concept of authority. This email takes advantage of authority by using members of J. Crew’s staff in the email. It’s not just a random group of individuals or peers suggesting the most popular products. It’s the staff. The staff are the people that live with the products and, most likely, know the company inside and out. This authoritative component helps to increase the persuasive elements within this email. Note: The principles of persuasion aren’t unidimensional. In other words, it’s not that only one principle applies here, while another applies there. Rather, they all can be combined and used together. Don’t be afraid to strategically coordinate and mix these principles together. J. Crew did with social proof and authority, and we can see firsthand how well that worked. The next example is by Yelp. 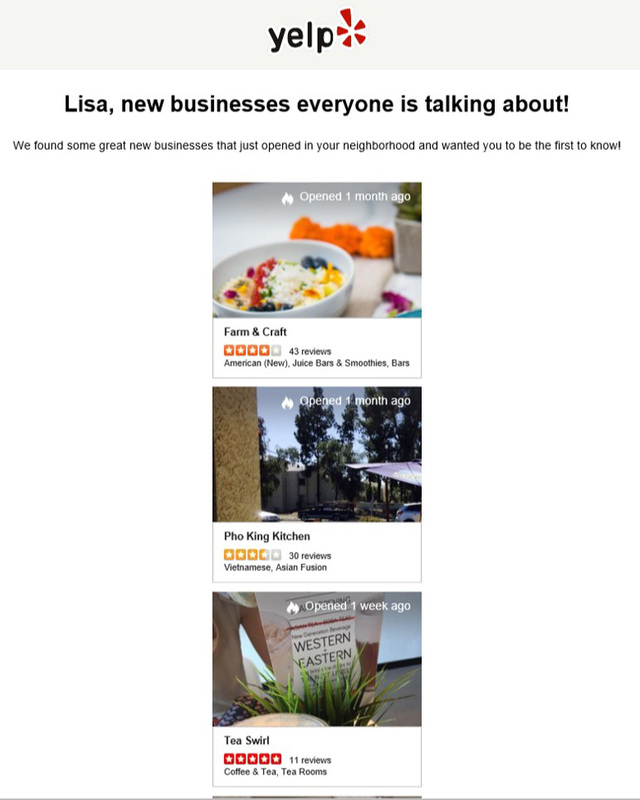 Yelp was able to use the principle of social proof within this email through their strategic headline that reads, “New businesses everyone is talking about.” Because of this phrasing, the user will feel persuaded and engaged right off the bat. They’ll feel influenced because Yelp tells them that everyone is raving about particular businesses in the area, so they feel like they should be too. For the most part, users don’t catch onto this notion that everyone can’t write a review for the companies Yelp is promoting. But even if users were to catch on, it wouldn’t matter. This is because the principle of social proof is so strong that it’s able to persuade users even when the persuasion element isn’t found to be 100% true. This ties back to the research and studies that support social proof. Individuals are hardwired to respond to hints of social proof even when that information isn’t completely accurate. Remember when we talked about the canned laughter study? In that example, users were prone to laugh even when they knew the laughter was fake. The same concept applies to this email. Users are enticed by the fact that everyone loves these restaurants even when they know there’s no way everyone can, in fact, do so. The last example we have on social proof is by a company called Meetup Inc. 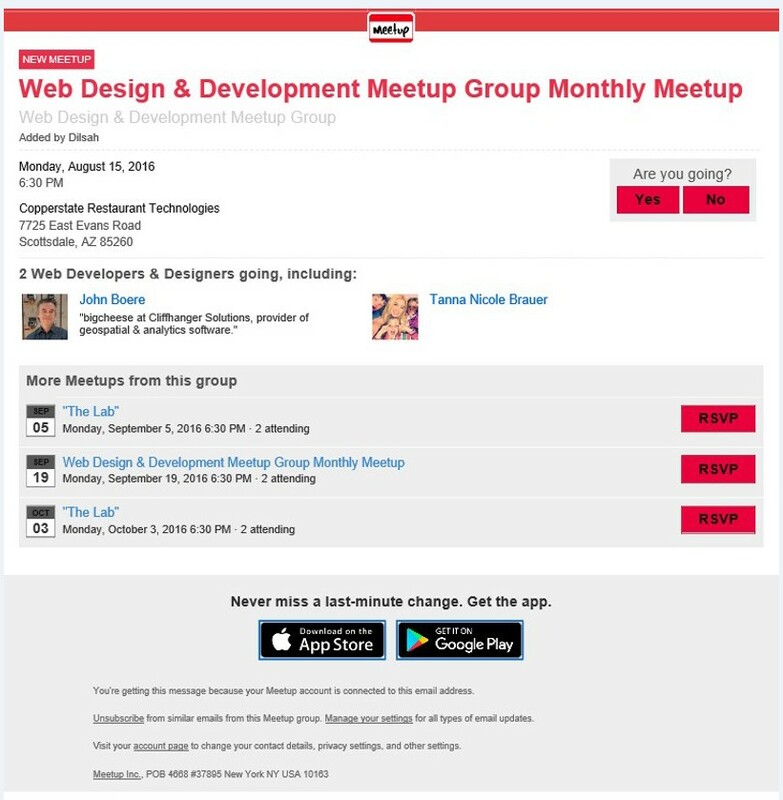 Within this email, the company is striving to get users to RSVP to a local, monthly meet up. Specifically, they’re doing so by mentioning that other individuals are attending as well. By mentioning that others are attending the meeting, Meetup Inc. is subconsciously persuading the user and leveraging social proof. We know this is effective because, based on the principle of social proof, users are more likely to RSVP for the event after they notice others doing so as well. This is what makes this particular email so successful. If Meetup Inc. would have stopped there, solely mentioning that several others are joining the meeting, the email could be successful. However, the company took it one step further generating an even more persuasive email campaign. As you can see in the below example, the email doesn’t just mention that others are joining the meeting. Rather, they say “Two web developers and designers are going,” and take it a step further by showing their names and photos. By sharing this line and including specific details about those who have already RSVP’d, the email is resonating with the user. You see, in this example, the user is a designer. So, by saying “two designers” instead of simply saying “two individuals,” the user is able to identify and connect with the email on a personal level, ultimately creating an even more effective email than before. This is a great example of a real opportunity in which you can make use of one-to-one marketing tactics. For those who are unaware, one-to-one marketing tactics are about strategically emphasizing personalized interactions with the user. For example, when one-to-one marketing tactics are successfully implemented into an email campaign, the email will feel as though it’s completely tailored to the user—that the design, content, and tone was created just for them. In order to implement these tactics into your emails, make sure you keep track of data from customer reviews, case studies, and testimonials. This data can include information like job descriptions, addresses, gender, and other significant demographic information. You can then use that information to align your reviews, testimonials, and RSVPs to the user that’s receiving the email. This will amplify the persuasive factors of your emails as well as amplify the use of social proof. To successfully execute social proof, remember to share information with your users such as “These people viewed this product,” “Those who viewed the product you’re interested in also enjoyed these items,” and “Our staff recommends the following products.” Phrasing your emails with verbiage like these allows the user to be influenced by social proof. Once the user realizes others are interested in a particular product, they’ll feel persuaded to favor that same product as well. Additionally, take these examples and personalize them to align your email campaigns with your users. With this tip, remember to think about one-to-one marketing tactics. Create your emails as though you’ve intentionally designed them for each individual user. After doing so, you’ll be one step closer to creating an extremely effective, successful, and most importantly, persuasive email campaign. To sharpen your skills further, make sure to read the fourth article within this series, which will focus on Cialdini’s fourth principle of persuasion, liking. There, we’ll teach you how to identify, apply, and execute this principle.